Jun Ko, Oct. 30, 2018, 3:53 p.m. The press conference for MBC's new idol audition program 'Under Nineteen' was held on October 30th! Producers Lim Kyung Sik and Jung Chang Won, MC Kim So Hyun, and mentors Dynamic Duo, EXID's Solji, Super Junior's Eunhyuk, and Crush were present for the press conference, where they gave further details on the program's format. Lim PD: "We will be choosing 9 out of the 57 contestants. We're also curious about what kind of team will be made. Each team has strong characteristics because the kids have different characters in vocal, rap, and performance. We do not know hwich ones will be going to the finals. Different combinations can form depending on if there are more rap members, vocal members, and performance members." Jung PD: In the 14th/final episode, 19 of them will be going through the final mission. 9 out of the 19 will be chosen for the debut team. These kids will be signing a 12-month contract with us and the partnering company (MBK Entertainment). We will be giving them our utmost support." 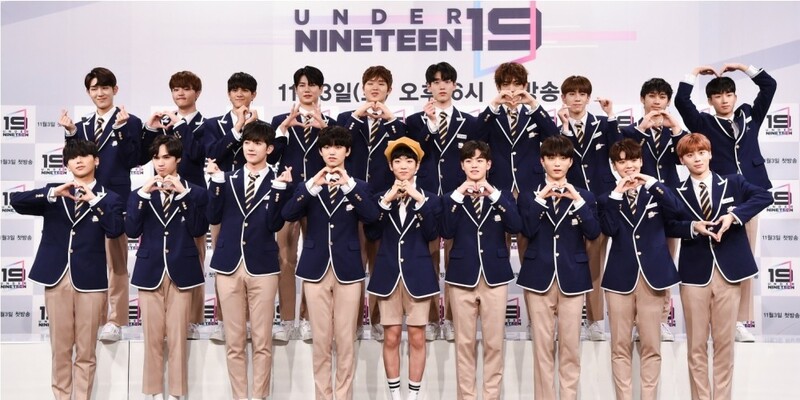 'Under Nineteen' will be airing its first episode on November 3rd!